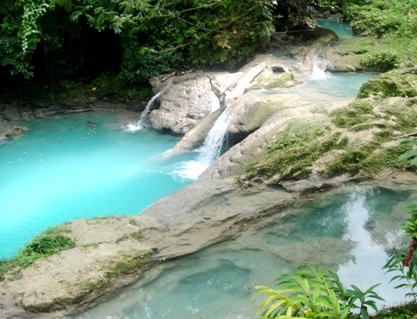 Visit Blue Hole or Dunn's River Falls for less!! 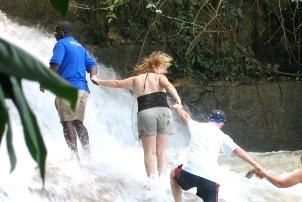 Jaital's exclusive "WaterFalls & Beach Run" is designed especially for the budjet traveler wanting to explore the Blue Hole or climb world famous Dunn's River falls and end the day on a private beach....all for one low price! Blue Hole (1hr.) 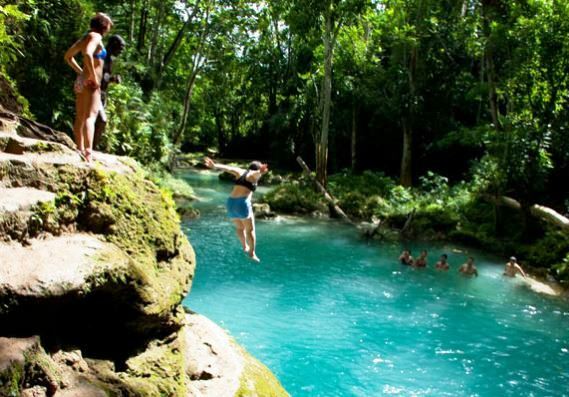 - Also known as the "Irie Blue Hole" "Secret Falls". Swim the blue waters, swing on the Tarzan rope, hike along the river, explore small caves, cliff jump and more. 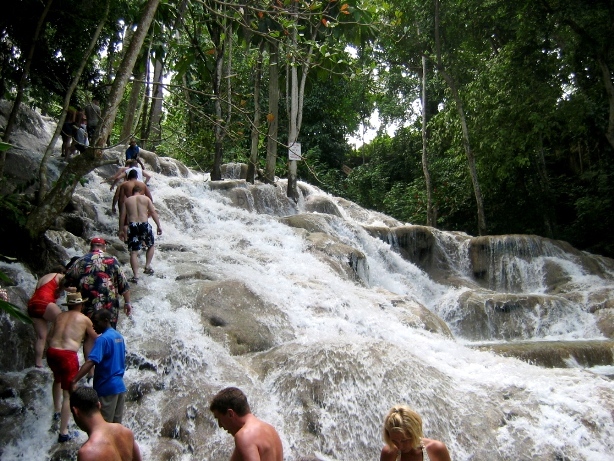 Dunn's River Falls (2hr. )- cascading waterfall which flows into the Caribbean sea. 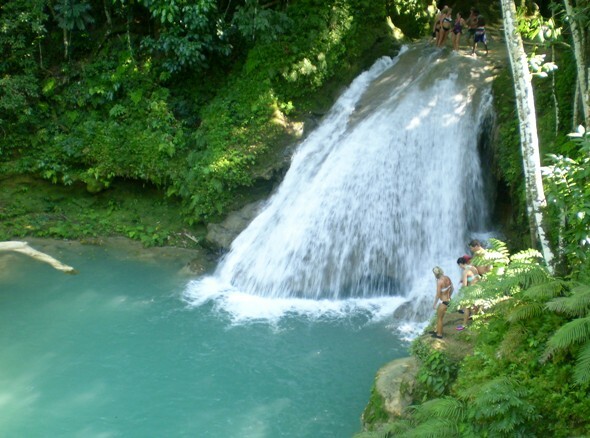 Climb the 600' waterfall and bask in its refreshing natural pools or sunbath on the nearby beach. Bamboo Blu Beach Bar & Grill (1hr. 30min.) - The ideal place to unwind after an exhilarating waterfalls experience. 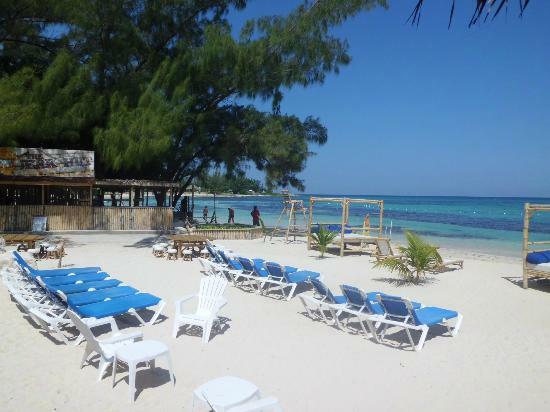 get a relaxing massage, enjoy a mouth watering Jamaican style lunch or take part in one of many activities available. Limited Jaital offer! Book now to guarantee pricing! • Great for the entire family! est experience ever! Thank you so much! Our experience was good! Michael, our driver, was very nice and gave us lots of interesting information on our drive to Blue Hole. Odean, our guide at Blue Hole, knew just what he was doing, and helped us have a great time while still staying safe. We would book with Jaital again! Amazing time!! Our driver Dwaine was so awesome! Blue hole was just beautiful. We couldn’t have picked a better excursion, with a better company. We will forever be using Jaital for all of our future excursions. Thank you for such a great experience! I can’t say enough about how great your team is. I’m not sure how, but there was a mistake in the booking process. We booked an excursion for July 27th, but we were in Jamaica July 26th. I called your representative using the number on the reservation. She was AWESOME! Got a call back in about 10 minutes, and she had a driver show up about 30 minutes later. I don’t know where the booking mistake happened, but I don’t care. Your team responded quickly and professionally and save the day for my family excursions. The driver was courteous, friendly, and funny. He made the excursion memorable. The van was clean and AC work great. We had a group of 12 going to two different locations. 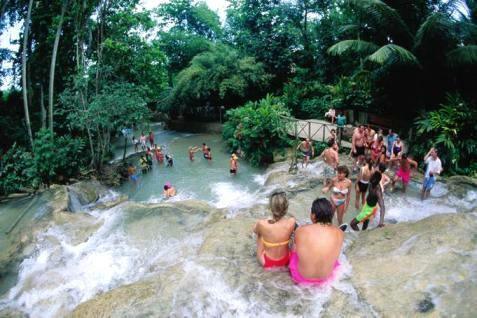 Blue Hole and Dunns River Falls. We had plenty of time to make both destinations and spend time at the beach after. It was Awesome! I will definitely be contacting you again if we make another trip to Jamaica. It was great! The guides, our driver and the guide at the falls, were both outstanding! Knowledgeable, courteous, and fun ! Will definitely book with your company again . I went on the blue hole and beach tour in Ocho Rios and had an amazing time! Our guide was very insightful and was able to tell us a lot about the areas we drove through. The actual blue hole was beautiful and I would definitely go back! We had a great time except for the beach stop. Did not care for the beach at all. We had a great experience! Our guide, Davida Miller was exceptional. I messed up our reservation dates online and she very calmly and efficiently made arrangements to accommodate us. She saved the day for us, and we are most grateful. Our driver was fantastic as well—we felt very safe with His driving on the road to Ochos Rios. The trip to the Blue Hole was exciting and we enjoyed Bamboo Beach as well. Both the guide and driver went above and beyond! We enjoyed our tour very much! There were 6 of us & all pleased. We enjoyed the waterfall experience very much. 2 of the women & myself, did not want to jump & our guide escorted us to an area that was still a nice way to get wet. The males of our group, were like teens & enjoyed the jumping experience. Our group had a great time !!! Davida was kind , knowledgeable , funny and personable ! We very much enjoyed the time spent with her on the long bus ride. Our driver was great too. My wife is a travel agent and will recommend Jaital tours. Thank You for making our day a wonderful day. Our driver GlenRon was very nice and took great care of us. The Blue Hole was so much fun and my grandkids enjoyed that very much. Our guide there took very good care of us even jumping in the water to help me out. I am 62. The beach was quite nice but was a little chilly that day due to the winds and the weather we were having that week..I would certainly book with you again. Thank You again. Our family had a very good tour on the blue hole and beach visit which left from Falmouth Port. The driver was on time and the guide was very informative and interesting and engage with the visitors. Overall, the places we visited were very nice as well. We had a great time at the Blue hole park and enjoyed diving and swimming and visiting the falls. The beach area and lunch by the beach were very nice as well. I think the guide and driver were both very professional and helped make the drive enjoyable. Everyone had a great time. We enjoyed the tour very much and the guide was fine. We were a late leaving port due to 2 persons not showing and he wanted to do what he could to make sure he took them! Would LOVE a tour that could incorporate Dunns River Falls, beach, and Blue Hole! (maybe for those not wanting to hike the falls ... but see it)!!! Or maybe the Falls and Blue Hole w/ no beach. (since there is a small beach at the falls) Would recommend and use again! Our excursion with Jaital was fantastic. The guide and driver were exceptional and very accommodating. The trip to Blue Hole was outstanding. The beach was nice as well. We were completely satisfied and would highly recommend your company to others. I want to inform you that Derrick (our driver) was beyond amazing- 5 out of 5 stars. He was very personable, informative about Jamaica and answered any questions we had quickly. The overall website, instructions to find the guide were exceptional. Overall definitely the best excursion we've ever done in Jamaica, and the kids absolutely loved jumping in the hole. I would highly recommend Jaital and its guides to our family and friends for future trips. We definitely enjoyed the Tour and excursion. The Driver was courteous and professional and informative. The staff at the Blue hole were enjoyable and made sure we had a good time and were always safe. We would recommend this to anyone else as a great bargain and wonderful adventure. We had a great local meal at the beach resort, though no running on the beach due to thunder and lightning. My husband and I had a WONDERFUL experience - we had a driver and he was fantastic. We really enjoyed our day at Irie Blue Hole and Bamboo Beach Club. He gave us a great tour of Jamaica all throughout the ride. We would 100% book again with Jaital if we ever come back to Jamaica!! It was a highlight of our vacation. The driver was excellent and informative and the blue hole experience was one of the best we've ever had on any excursion. We thoroughly enjoyed our excursion. Our driver was informative and very accommodating to what the group wanted to do. Your prices were also a lot better than other places I checked with. I would use your company again if we go back. It was a great experience both our bus guide and our guide at blue hole were wonderful. We had an amazing time. The guides were great with taking pictures and helping us through. Really glad we choose this excursion. Our day in Jamaica was the best shore excursion we had on our entire cruise. I had specifically requested Vincent as our guide based on reviews I read on Trip Advisor. I was not disappointed. We got a very personalized tour along our way to Blue Hole and wonderful narration of the area, customs and learned much about the Island and its history. I would visit Jamaica again based upon this wonderful first impression. In preparation for our cruise, we actively looked for top things to do while in Falmouth and happened across your web-site and a number of highly recommended reviews on trip advisor. You have a great selection of itineraries and reasonable rates. We selected the Blue hole and Bamboo Blu beach run as it provided the opportunity to see Ocho Rios as well (were there 30 years ago). Ship de-barked 30 minutes late (8:30 AM, 29 March 2017) due to customs clearance and we found Vincent very quickly and were surprised to find that we were the only ones that had booked this trip with you. Vincent made a great first impression as he was immaculately dressed, very personable and had a very clean vehicle. 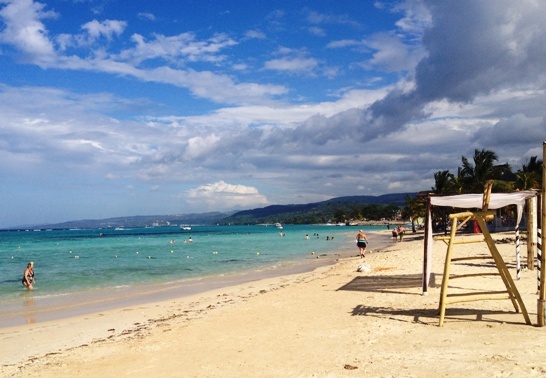 We reviewed our itinerary, our desires to see parts of Jamaica and he made some excellent suggestions. He was proud of Jamaica and eager to share his knowledge and experiences with us. A great opportunity for us to see the positive changes that have happened. We arrived at the falls area before it became overly crowded and Vincent chose Deelon to be our guide. This was a great choice as this young man again shared wonderful information on the area and his personal story. He was efficient in getting us safely through the falls and we were able to circumvent some of the larger (30 pers +) groups while seeing and participating in all the activities. He offered to take pictures of us as well with our camera and we have some great memories. All in all some 60 minutes spent in this location that is not yet as commercialized as Dunn Falls. On the way back noticed that the trail had become jammed with tour operators so we were lucky to avoid this rush by getting there early. We proceeded to Bamboo Blu beach and spent a good hour there in the water ensuring that we had plenty of time to visit the iconic Scotchie's for a lunch based on Vincent's advice. A great meal and great prices! After a relaxing hour, had a nice drive back again with more talk and exchange of experiences and had plenty of time to do the sight-seeing at the port shopping complex. We were very happy to have met Vincent. He truly made this the best excursion off the ship while on this cruise. Both of us and Vincent had a great time and we felt we made a friend. We highly recommend Vincent and Jaital tours to visitors as they can provide for all your needs at reasonable prices. Will miss your pleasant attitude and look forward to our next visit to Jamaica. Was on a cruise With RC Liberty of the Seas and looking for an excursion. I booked with Jaital after I had checked reviews on here before booking and so glad I did. 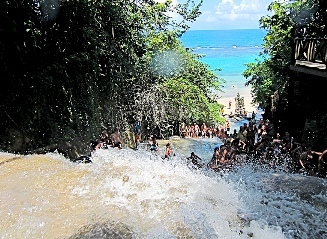 We booked the Dunn's Falls and BluBeach excursion. Best decision I have ever made. First off Saved more then 50% off for the exact excursion offered by cruiseship. First off getting off the ship in the port it was a little hard to figure out where to go had to ask multiple people to find where to go. It is literally out of the plaza until all buildings end on the left. Our wonderful Driver Vincent was beyond astounding. He took us to our private van 4 of us in a private van. Very awesome guy nicely dressed and right way explained the island, history etc. By the way they drive on the left and the steering wheel is on the right so very odd for us Americans. But Just wow. we stopped at a place Columbus discovered Jamaica and took pictures at the mural . then off to Dunn's falls. He could not go into the park but waited as we did our excursion. we were first there it was beyond amazing. we literally left all our items in the car with him and built such trust with Vincent. He then drove us to the beach asked us what time we wanted to leave to make sure we had plenty of time to get back to port plus we wanted to shop. The beach was crystal clear and they had reef wish we had known would have brought our snorkeling gear. It started getting very hot and most of us were already burnt. so we found him and asked to go shopping. He took us to a place that was scary to us but must be his friend. They wanted double of what we found on the port so we bought nothing. He stopped on the road so we could take picture of the goats so many here. Vincent became family for the day would hire him back without a thought. I would highly recommended you use Jaital. Thank You so much. It was great. Our driver Peter was awesome, so friendly and informative. I would love to take the time to leave feedback on our tour! I've already taken the time to write a review on Trip Advisor. Simply put - best tour EVER!!! Vincent was so professional, friendly and nice! And everything about our day was absolutely perfect. We couldn't thank Vincent enough at the end of our day. Even our 12 year old nephew, the harshest critic, thought it was an amazing day. He wanted to stay and do the Blue Hole all day! Bamboo Beach was OK (nice, but we were really mostly only interested in the Blue Holes). The guide at the Blue Hole, Robert, was so nice as well. He took care of our 7 year old, took pictures and showed us a great time. I cannot say enough nice things about Vincent - he took the time to explain everything about Jamaica, he was patient with our impatient daughter (she thought the drive was a bit long ;-)), and he took us to Scotchies, which we loved. He even took the time to stop for Jamaican Patties, which was so nice. His appearance was professional, his car clean and everything about him was excellent. I've already recommended your company to friends who will be travelling to Jamaica. We felt pampered and completely taken care off all day, without a single worry in the world! Please extend our thanks to your entire organization for an unforgettable day! There is nothing that I would change about this excursion. I have given a wonderful review on Trip Advisor and expressed my satisfaction on Facebook as well. Thank you for a great vacation experience! We thoroughly enjoyed our day tour to Jaital Waterfalls & Beach Run. I prefered this tour to the Duns River Falls tour that I took with your company last year. This tour was very well organized, we had a guide for just the two of us & he was excellent. This was the best day of our holiday! I would have no hesitation in recommending Jaital Tours. We had a wonderful trip and a very friendly driver! It was great and we always would do this again! The combination is perfect. It was a wonderful experience with a very polite and helpful guide/driver for the 2 of us. He was very adaptable to our questions and needs. I would highly recommend this excursion. We enjoyed the trip very much and bringing us back to the cruise terminal in good time. Thank you, it was an amazing experience. We absolutely loved our driver, Vincent. He took such good care of us and even stopped us off to try Jamaican pudding and patties. We would have liked to have stayed longer at Blue Hole to just relax but we later on the drive home learned that the jaital tours was only the driver. The tour guide at blue hole was part of the blue hole park and we felt a little rushed. One thing I would suggest is to let those who book a blue hole trip know that water shoes are required. We were required to rent their water shoes for $7 which is an option but had we known we could have brought some from home. If we go to Jamaica again I would definitely book with Jaital tours. I will also tell my friends, thank you for the good experience! The experience was great and very fun. I liked the fact of having a driver with us all the time. 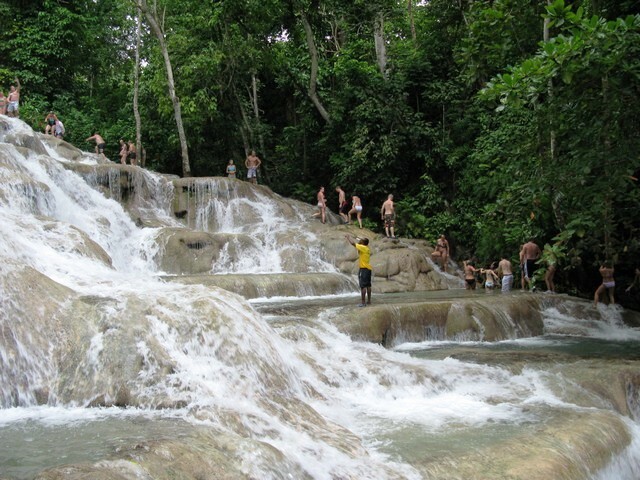 The Dunns River Waterfalls was a great experience! The trip was very good! We had so much fun at the Blue Hole and was sad we had to leave. This was the most adventurous tour we had done on or vacation. Falls are very nice and we felt like we had the river to ourselves. Great for family and even young ones. The river is truly beautiful. Then we went to the beach and find it quite nice too. Everyone was so friendly and nice. Definitely recommend this tour. This tour was worth every dollar we spent. We had a wonderful time at the falls and great Jamaican food at the beach. Our day went very well. First stop was at the falls and then we were headed to the beach. Good food and music. Everyone was so kind and helpful. Thank you for a wonderful experience in Jamaica. We really enjoyed our excursion to Blue Hole with our two teenagers. Our bus driver, Ricardo, was extremely courteous and informative and shared lots of great stories and history of the island along the way. 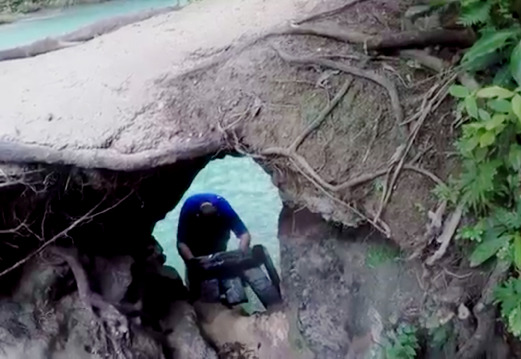 Once we got to Blue Hole, Devroe took us on an amazing adventure in the waterfalls. The scenery was absolutely breathtaking and he made sure we all had a great time while keeping us all safe. Overall, we had a wonderful experience with the staff at Jaital and would recommend your services to fellow travelers. We hope to visit again one day! We were extremely pleased with our tour. Kurt was our guide. He would very professional, and a great driver. He gave us great information about what to take to the Dunn River Falls climb. It was so nice to have a private van for our family. Jaital was an adventurous excursion. We captured photos of climbing waterfalls and jumping into water holes. Everything was perfect from booking online to meeting our driver. He was very nice and courteous. The falls is stunning and the beach was clean. Overall a great experience! We had an awesome experience going to the Blue Hole! Everyone from our driver to our guide at the waterfall was very friendly and made the experience great! I would give a special shout out to Marlon (I think that was his name) at the Blue Hole. He was so great with my 6 year old daughter. Carrying her up the falls and jumping off the cliff with her, making sure she was safe. The beach was great, too. Good food and amazing views. The water and the reef were gorgeous! Everything was very well run. Nice bus and everything was great! We also felt very safe, which was one of my worries for this island. I would not hesitate to venture away from the cruise ship excursions and I will use Jaital again in my future travels. We had a very good experience with Jaital. The driver was friendly and knowledgeable and drove safely to and from Blue Hole. The excursion itself was a blast for my family and I. The tour guide at Blue Hole was excellent and friendly. My complaint is more with the other travelers on our bus. One group was late getting to the bus in the morning but luckily our driver was still able to get us to our excursion on time. Some other travelers forgot water shoes but luckily, our driver was able to have them buy some without everyone having to get out of the bus and go shopping! I would have liked some time to peruse the shops at the Port. We stopped at a local souvenir shop on the way back to the ship which was fine but it gave us no time at the port. I did appreciate how friendly the woman at the shop was. She was very sweet to my daughter. When on vacation you want to be around people who smile! The Blue Bamboo beach was beautiful but the food was overpriced for what you received. It was very windy the day we were there so made eating outside a little difficult. Would probably help if they had some way to put down screens/shades. Our (glass) water glasses actually blew off the table. Luckily, they did not break! The service was great and everyone was friendly at the restaurant. Might have been nice if they had some music playing on a speaker. We bought some souvenirs at the little shop at Blu Bamboo. Seems the people working there could have been more friendly. Did not feel welcome. Overall, I would recommend Jaital to friends. For the price, it was unbeatable! We enjoyed our trip to The Blue Hole. Our driver, Paul, went over and above and made sure our trip was as enjoyable as possible. I just want to say that I am happy I booked with you guys. Our tour guide, Bradford, was excellent from beginning to end. He was courteous and very knowledgeable. I learned so much from him and he made us feel very comfortable. Irie Blue Hole was absolutely beautiful & so much fun. All of it was just an unforgettable experience and I will definitely be booking with you guys when I plan my next trip! Thank you so much, especially to Bradford. It was such a pleasure getting to know him. Great time! I found the tour to be very professional and would highly recommend. Thank you so much for your outstanding service. Our driver, Vernon, made our trip memorable with his professional and friendly service. He went above and beyond for us to insure our trip met our expectations. By the end of our trip we felt like we had made a new friend with Vernon / which we did. We will certainly be visiting Jamaica in the future and look forwarding in booking trips through Jaital and setting up travel with Vernon, again very soon. We have spoken very highly about our wonderful experience to all our Friends and Family. Thank you for your Exceptional service. The falls was breathtaking!!!! Great value for money! We had a blast! The blue hole was an absolute beauty!!! I found Jaital to have the lowest price for my boyfriend and I. We did the Dunn falls and beach. thanks. The Dunns Falls is a spectacular place, we will recommend this tour to our friends, also we will not hesitate to recommend your company. We enjoyed the falls and refreshing water. Dunns river is nature at its best. We will definitely visit again. We had an amazing tour with our driver when we visited Jamaica in April for spring break. I appreciated the personal experience he provided, he went above and beyond and really took care of our whole family. The car was comfortable, he found an expedited way to get us into the falls making the wait time shorter which was much appreciated. The beach we visited was lovely, not crowded. We felt safe & taken care of. He even stopped so we could try some Jamaican pudding which we all loved. He shared history about the island as well. This is the only way to tour around in Jamaica. "I had the most wonderful experience.........Blue Hole waterfall tour....."
We had a fantastic day. We would like to express our extreme satisfaction with our driver. He is a very lovely person, who took care of us all very well. It was a great excursions. For well organized & our driver was fantastic. He was on time, polite, easy to talk with and very accommodating. The blue hole was beautiful! Our guide at the blue hole didn't seem very into the experience, he was nice & took us through the falls but after hearing from some other groups, it seems they had a bit more of an exciting time at the blue hole b/c of their guide. Good value for the money. Our driver was very helpful and the river guide went beyond to make sure we were safe at all times going up the falls. The climb was a lot of fun! Our trip was wonderful! Our driver was funny,entertaining & shared with us about his country. We loved the Blue hole! Its a beautiful place! We had a wonderful time. Our driver was exceptional. He was very well informed, friendly and helpful. We would definitely book with Jaital again. My group had a wonderful time with Jaital tours. We got to have an experience like no other! The tour group was very small and Vernon was extremely helpful. He answered any questions we had and made sure our experience was a good one. I am glad I found Jaital Tours before we went on our cruise. Keep up the good work! We had a wonderful experience on our tour. Our driver was very nice and shared lots of interesting facts. This was the best part of our holiday!!! The falls was superb and we had an amazing time. The beach is really nice and the food is great! Would definitely recommend this tour...affordable and reliable service! Great value for your money!!! My boyfriend and I had a blast at the waterfalls. A true hidden gem. The jerk chicken at the beach was the best I've had. The driver was professional and told us about the local areas. We recommend this tour to anyone visiting jamacia. Thanks Jaital!